If you have been diving with us, then you are familiar with Corona Del Mar State Beach. I know you’re say, “No, I don’t want to go there again”. Did you know that right next door is one of the prettiest dive beaches with so much marine life and all in relatively shallow water. Well check out this review of Little Corona Del Mar from Dale Sheckler for California Diving News, November 2018. Repeatedly diving a particular location has its benefits. You get to know the “lay of the land,” individual animals, seasons, and ecological shifts. But at Little Corona the ocean throws something new at us every time we dive there. Our first dive there years ago produced a huge horn shark at over four-feet long. Subsequent dives over the years have produced large halibut, big bat rays, marauding sea lions, dolphins, diving cormorant birds, as well as the more common but just as delightful congregations of garibaldi, señoritas, and other common Southern California undersea fauna. Little Corona lies in the Corona Del Mar area of Southern Orange County. It is on the southernmost corner of Newport Beach. Beaches here are very popular with summer crowds. Most of the sunbathers and volleyball players seem to end up at Corona Del Mar State Beach just to the north of Little Corona but this lovely little beach also has its devotees. Access at Little Corona is a little bit more difficult than at the state beach but definitely worth it. Parking is on the street and is very limited, so arrive early. A moderately steep paved path leads to the beach; perfect if you want to wheel your equipment down to the beach. The top of the path affords a good view of the cove and diving area. The water is usually clear enough to make out the reefs on either side of the cove. Two-thirds of the way down the path are restrooms and a freshwater shower. Take a moment to look over the view of the coast from this spot. It is quite stunning with fascinating rock structures in the surf zone including a wonderful arch rock. Water entry is off a sand beach with a moderately sloping bottom. Loose boulders often dot the bottom in the surf zone; don’t get tripped up. 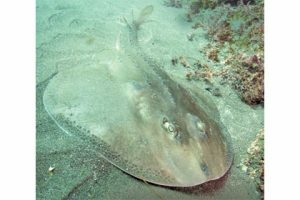 The reefs to the south are generally more interesting, but the north side tends to attract an interesting array of halibut, bat rays and other sand bottom dwellers. If you wish, the cove is small enough where you could explore both sides in one dive but why rush. The south reefs extend far down the coast and, if you’re inclined to swim a lot, offer a large area to explore. In the perimeter of the rocks where the ledges meet the sand you might find lobster, thornback rays and, out deeper, a sheep crab or two. A buoy has been placed on the south reefs to ward off the many boats traveling from the nearby Newport Harbor. Water depth here is 25 feet. The reefs extend beyond this point to 30 feet deep, but watch out for the many boats. Like much of Southern Orange County, water visibility is usually good here, averaging 15 to 20 feet. Water clarity of up to 30 feet is not unusual. Because many of the reefs are fairly shallow, surge can be a problem but other than this, currents are generally not a problem. Because the reefs here are at the mouth of Buck Gulley it is best to avoid this site after a substantial rain. While not as colorful as the Laguna Beach reefs to the south, Little Corona offers enough to keep the photographer and sightseer delighted. There is a variety of starfish, small stands of gorgonian, and nudibranchs are common. Depending on the season, stalks of kelp shade the southern reefs. What surprise awaits you at Little Corona? The only way to find out is to dive it. Skill Level: All with beach diving experience. Location: At intersection of Poppy Ave. and Ocean Blvd, two blocks off Pacific Coast Hwy. in Corona Del Mar. Access: Moderately steep but paved path to the sand. Facilities: Shower and restroom near the bottom of the ramp. Entry and Exit: Sand surf entry but often rocks in the surf zone. Visibility: Good, averaging 15 to 20 feet. Photography: Fair to good. Best for macro. Hunting: Part of the Crystal Cove State Marine Conservation Area. Recreational take of any marine resources is prohibited except finfish, lobster, and urchins. Cautions: Rocks often hidden in surf zone. Boat traffic from nearby Newport Harbor.